You guys, I am so excited to share this recipe with you all. 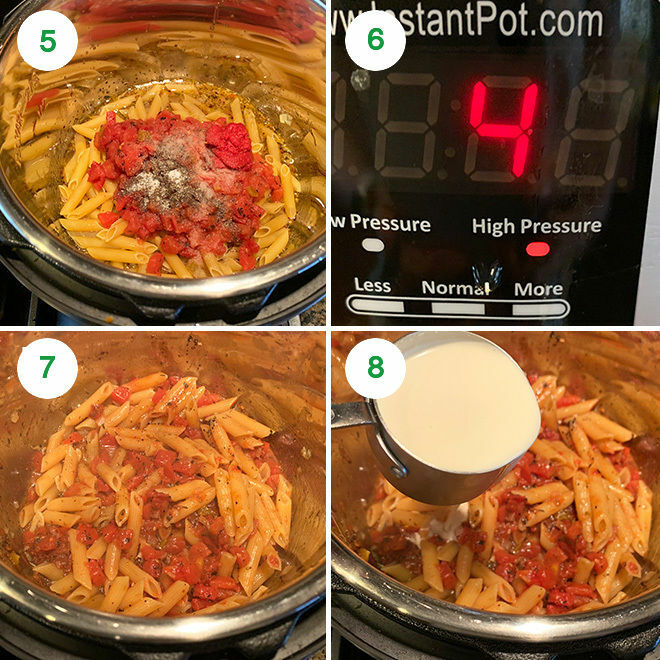 I have been meaning to share an instant pot tomato based pasta recipe here for so long. But I wanted it to be perfect before I could share. And finally, I am thrilled to share a recipe which I absolutely love! ✓ you only need 20 minutes to make this! Yes only 20 minutes between you and this creamy goodness! ✓ topped with pine nuts for that extra flavor and crunch! I never thought much of Instant Pot pasta dishes until I made this Thai Peanut Noodles. 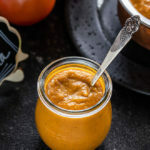 You guys love this recipe and it also gave me the confidence to try more of such one pot recipes in my pressure cooker. My aim is to always make recipes easier for you guys. I know you guys love easy recipes which save time in the kitchen and are also filling. 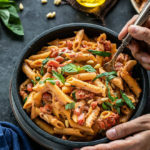 This one checks all those spots so I hope you guys will love this pasta recipe just as much as you loved the noodles. 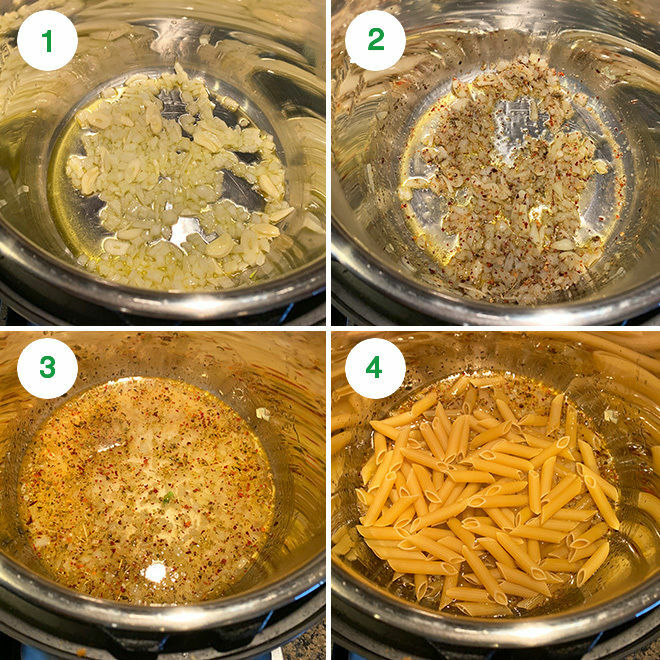 The biggest challenge when cooking pasta in the Instant Pot is a) to make sure that the pasta is cooked but not over or under cooked and b) there’s no burn message and the pot comes to pressure. Talking about the burn message, I did wrote a post about FAQs about the Instant Pot and covered the Burn message topic in it. So if you guys still haven’t checked it out, maybe its time so do so now especially if your model is prone to getting the dreaded burn message. For me, 4 minutes at high pressure with a quick pressure release works perfect for the pasta. It’s al dente and that’s exactly how I like it. This is for regular pasta made with flour. 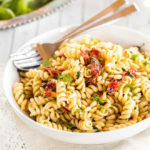 If you use pasta made with different grains, then that will definitely effect the outcome. 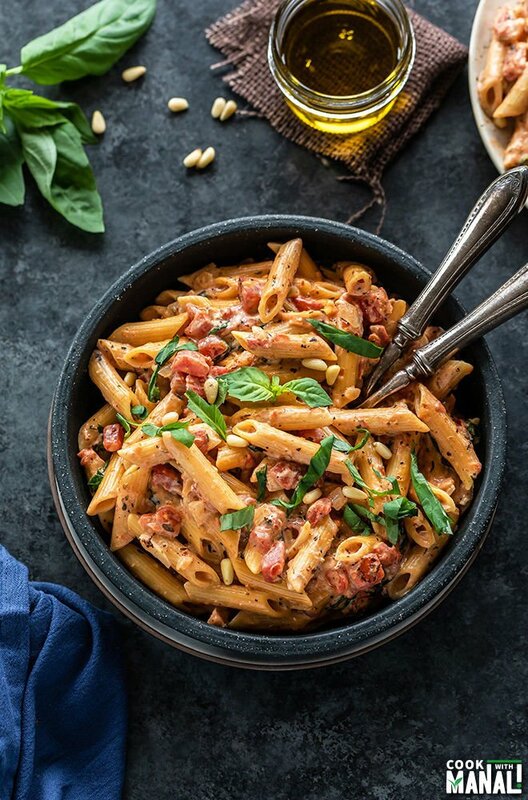 For this recipe, I have cooked the pasta for 4 minutes but if you prefer softer pasta, cook for 5 to 6 minutes on high pressure. Also, press the pasta slightly so that it’s little under water. I didn’t do it and it still cooked perfectly for me. Coming to the burn message, if your model is prone to getting it, do use 1.5 cups water (12 oz) for this recipe, especially if you have the 8 qt. I have not tested it because I don’t have a 8 qt but from what I see and read, I think it would need the extra 1/2 cup water. Also don’t stir the tomato once you have added it to the pot. That can cause a burn message too. In case your pot doesn’t ever get burn message, then feel free to stir everything together. I also use saute on “less” mode for this recipe. The reason is that I don’t want the onion and garlic to burn, they should get fragrant but not burn. Also sauteing on low will make sure there aren’t any brown bits at the bottom which eventually means no burn message! 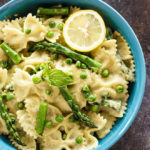 With abundance of fresh basil in the market in spring and summer, this recipe will be a repeat in my kitchen in the coming months. 1- Press the saute button and then press the adjust button to set saute to “less”. Once it displays hot, add 2 tablespoon olive oil. Add garlic and onion and saute for 4 to 5 minutes until fragrant. 2- Add Italian seasoning, red pepper flakes, sugar and stir. 3- Add 1 cup water (you might need 1.5 cups water for 8 qt IP). Make sure there’s nothing at bottom, most probably there won’t be as we saute on low heat. 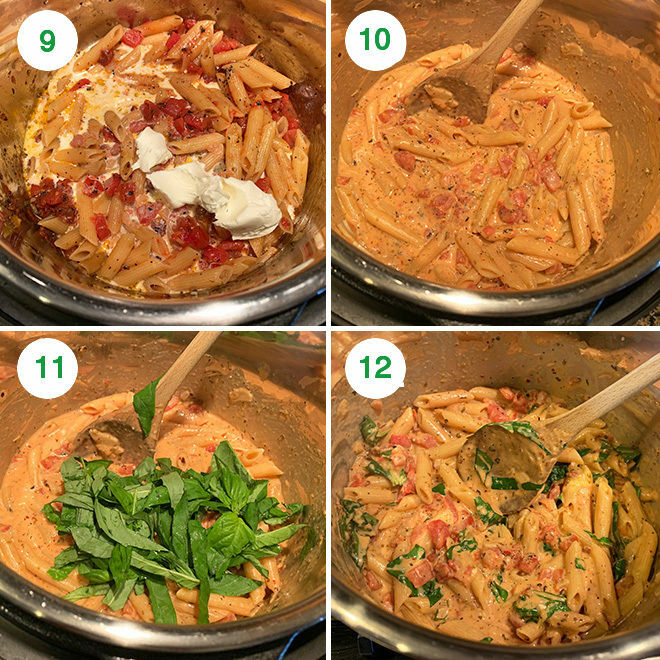 4- Then add 8 oz penne pasta. 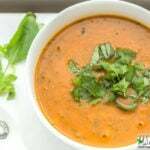 5- Also add a can of diced tomatoes, tomato paste, salt and pepper. Do not stir especially if your Instant Pot model gives the BURN message. 6- Close the pot with its lid. Press the manual or pressure cook button and cook on high pressure for 4 minutes. For softer pasta do 6 minutes. Quick release the pressure by manually moving (be careful) the pressure valve from sealing to venting position. 7- Open the pot and stir everything together. Press the saute button again and use the adjust button to set saute to “less”. 8- Add in the heavy cream and stir. 9- Add the 2 oz cream cheese and stir. 10- Keep stirring until the cream cheese melts and mixes well with the sauce. Taste test and adjust seasonings at this point. 11- Then add fresh basil and stir. 12- Also add the pine nuts (if using, optional) and mix. 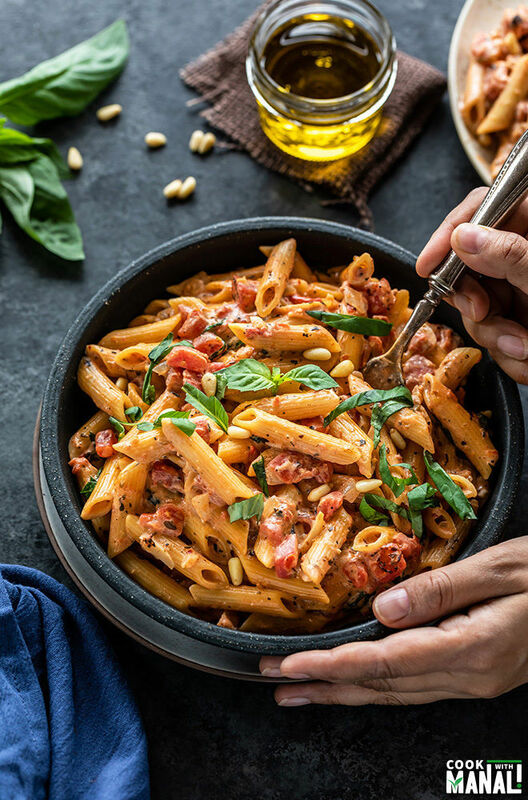 Serve this creamy tomato basil pasta with more basil or parmesan cheese. Enjoy! 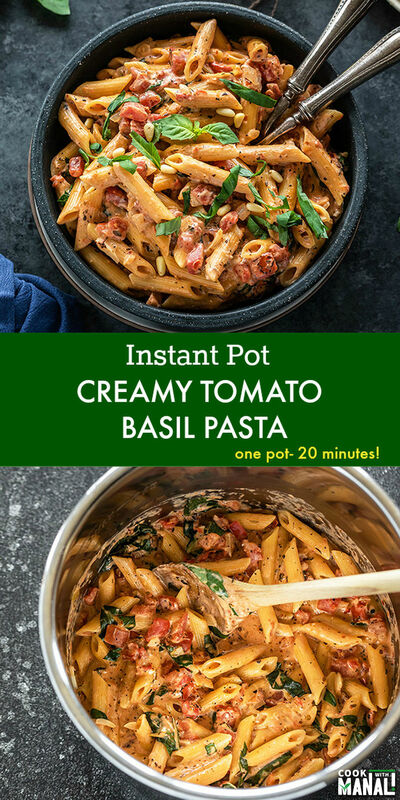 If you’ve tried this Instant Pot Creamy Tomato Basil Pasta Recipe then don’t forget to rate the recipe! You can also follow me on Facebook, Instagram to see what’s latest in my kitchen! 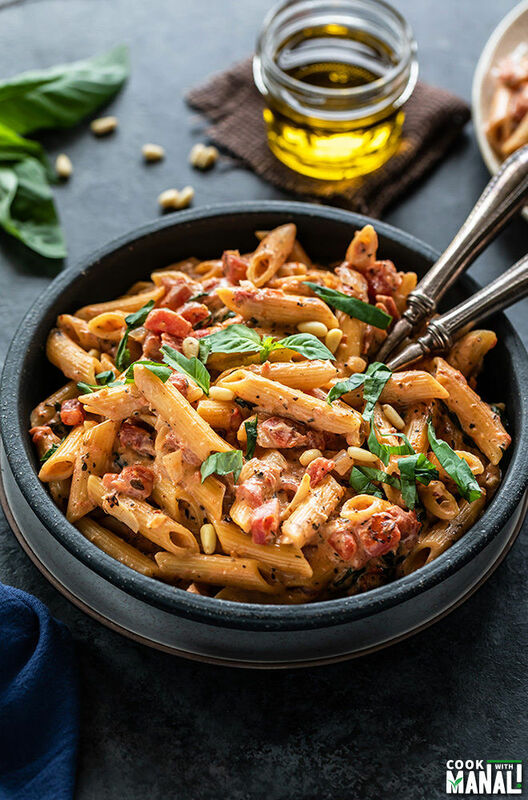 Creamy Tomato Basil Pasta gets done in the Instant Pot in only 20 minutes! 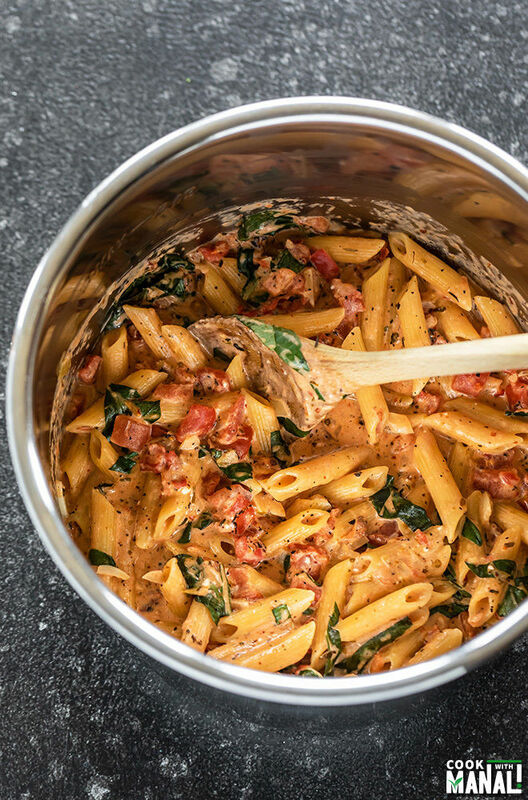 Perfect one-pot meal for busy days! Press the saute button and then press the adjust button to set saute to "less". Once it displays hot, add 2 tablespoon olive oil. Add garlic and onion and saute for 4 to 5 minutes until fragrant. Add the Italian seasoning, red pepper flakes, sugar and stir. Add 1 cup water (you might need 1.5 cups water for 8 qt IP). Make sure there's nothing at bottom, most probably there won't be as we saute on low heat. Then add 8 oz penne pasta, a can of diced tomatoes, tomato paste, salt and pepper. Do not stir especially if your Instant Pot model gives the BURN message. Close the pot with its lid. Press the manual or pressure cook button and cook on high pressure for 4 minutes. For softer pasta do 6 minutes. Quick release the pressure by manually moving (be careful) the pressure valve from sealing to venting position. Open the pot and stir everything together. Press the saute button again and use the adjust button to set saute to "less". Add in the heavy cream and stir. Add the 2 oz cream cheese and stir. Keep stirring until the cream cheese melts and mixes well with the sauce. Taste test and adjust seasonings at this point. Then add fresh basil and stir. Also add the pine nuts (if using, optional) and mix. Remember to not stir after adding the can of diced tomatoes if your model of Instant Pot gives Burn messages. If using a 8 qt, you might need to add extra 1/2 cup water. I have not tested this recipe in a 8 qt but because it has a larger surface area, extra water might be needed. Cook for 6 minutes on high pressure for softer pasta. Made this last night and this is probably the tastiest pasta I ever made from scratch!!! Thank you!